I was going through some of my dad's books with him today, and came across one from 1975 called Modern Board Games. I'm ashamed to say, I snickered a little on the inside. "Yeah right," I said to myself, "Monopoly, Battleship, Scrabble, ..."
Well, with a cover like this, could you blame me? If I were better read, I would have recognised the name of the editor. David Pritchard was a very distinguished writer on games of all kinds, in particular on chess variants. An obituary written for the British Chess Variants Society is a particularly interesting read. The book, too, is quite a gem. Chapter 1, by "leading player" Daryl Francis, discusses Scrabble in considerable length (15 pages). The article is, primarily, an overview of gameplay with some notes on tactics and a very brief history. Interestingly, the article credits James Brunot as the designer, where BoardGameGeek lists Alfred Mosher Butts as the holder of that honour. Quotage: "[G]ood offensive play is an art. If an inexperienced player attempts offensive play, opening up premium squares for his opponent, he may well end up giving the game away." Chapter 2 discusses Diplomacy, and is written by Allan B. Calhamer, the game's designer. Again, there's a discrepancy, with BGG attributing the game to 1959 and the book noting that the game's development was completed in 1954 (maybe it just had a really, really long time to market). The article gives an overview of play of the game and of strategy and tactics, as well as the different playing styles that can evolve. It also includes notes on the gaming landscape at the time. Of all the articles in the book, I think this is probably the most interesting. Quotage: "Every year sales of the game go up, its popularity probably due to the fact that it is unique among adult board games for its free negotiation between players in which (almost) nothing is barred." "Diplomacy has pioneered, among games of this type, the introduction of simultaneous moves, as well as the use of unstructured negotiations, permitted deception, independent parties, asymmetrical starting positions, conflict on a continental scale, and significant weight given to both land and sea forces." Chapter 3, also by the game's inventor, focuses on Terry Donnelly's Decline and Fall. I have to confess, I haven't played this one; it gets a 6.7 on the Geek, but most of the comments seem to refer to its status as a relatively early 'classic'. This article starts with notes on the development of the game, including some interesting geological developments "in the search for compromise between geography and the demands of a workable grid. The course of the Danube was altered several times; islands were squeezed and shoved and made to fit neatly.". The author discusses the concept of the game, showing a clear link between theme and game structure, then moves into gameplay and strategy, giving strategies for each player. 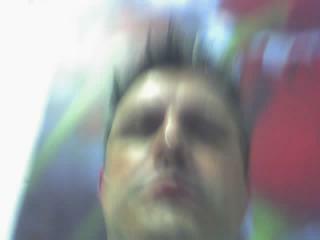 Quotage: "Decline and Fall is not just a simulation, of course: it is a game. It is usually played in good spirits with lots of bantering among the players, ranging from serious bargaining to an imaginative commentary on the events on the board. This banter is an integral part of the gamem and playing partners should be chosen with this in mind." Chapter 4, by David Parlett, discusses Dr Eric Solomon's The Sigma File (released in the US as Conspiracy). Parlett is "a games researcher, inventor and established writer" and is the author of several articles in the book. His style is approachable and descriptive, and highlights the more unusual features of the game while still giving an overall feel for the game itself. As with Decline and Fall, this article successfully uses the game's strong theme to explain the rules. Quotage: "The Sigma File ... has all the ingredients of long-lasting success : easy to learn and play, no complicated rules or terminology, and simple, clear-cut objectives. Yet despite its simplicity, the game gives rise to intriguing situations and last-minute revelations, and rewards careful observation and calculation. And it is primarily a game of bluf - which calls for skills that transcend the age barrier. Play it with friends, and you'll soon be wondering who your friends really were!" In Chapter 5, the book returns to a more traditional boardgame: Mastermind. The article's author, David Wells, "specialises in abstract games" and was, at the time of writing, Puzzles editor of Games & Puzzles magazine, the book's publisher. As well as giving an overview of the gameplay, therefore, this article focuses on the game's "solubility." Wells gives plenty of tips for new and more experienced players, and claims that any combination of 4 colours can be solved, without chance, in 5 rows. He discusses the role of chance and also lists common variations for the game. The most interesting of these, to me, is to vary the amount of information which is given to the player who is "guessing" - Wells lists four different possible rule variations that give this. Quotage: "it is possible to list all the possible distinct positions in the game and determine the winning move, or moves, in each. ... it is not impracticable, but takes long enough to be an instructive exercise for, say, a sixth form mathematics student or a problem fanatic, while being a little too complex and time-consuming for almost everyone else." Quotage: "Monopoly is not just a game, it is also a clash of personalities. You will look in vain for openings and conventions and strategies such as befit gentlemanly pursuits like cricket, chess and snooker. Once you have been dealt your first £1500, you're on your own. If you sit back and 'play safe' you deserve to lose, and probably will. If you sit on the edge of your seat and play recklessly you will do no better." In Chapter 7, we return to an abstract - this one Twixt, reviewed by David Wells, the book's go-to-guy for abstracts. Twixt is an Alex Randolph design first published (according to the Geek) in 1961. Like Wells's earlier article, this is a very theoretical and mathematical article which focuses more on solving than on explaining the game, although a rules overview is included. Quotage: "Notice that in order to break your opponent's double joint it is necessary to have one of your pegs in the near vicinity but not on or too near to the line joining the pegs (type AB excepted). Conversely, therefore, if you wish to leap round an opponent's peg, try to leap more or less straight across it." In Chapter 8, the last of David Parlett's articles, he discusses Cluedo - or "Murder at Tudor Close" (Clue to our american readers). He gives a run-down of the game and its strategies as well as the skinny on some personality traits of some of the people in the game (did you know that "Miss Scarlett" probably ISN'T her real name?). The notes on how to make detective notes are particularly detiled. Quotage: "Cluedo is a splendid introduction for children to games of deduction through question and answer. The dressing up as a board game (in essence, it is really only a card game) sugars the pill without detracting from its success as a sociable form of mental exercise for adults." Chapter 9 is concerned with Tri-Tactics; author John Humphries is "an authority on proprietary games, a games inventor and writer". This is another early game (circa 1932/5) which does not seem to have lasted as well as most of the other games in the book. This article is relatively brief, but discusses gameplay and tactics for deployment and movement. Quotage: "Tri_Tactics is a very good initiation to wargaming. It is simple in concept, yet experienced players can employ a wide variety of strategies and tactics not all that dissimilar to 'real life' war." Chapter 10, by journalist and game enthusiast Josie Matthews, covers the game Speculate. This was a relatively recent release when this book was published (released in 1972; book published 1975) and sounds like it has similarities to Stock market, which Fraser and Biggie play when they can. 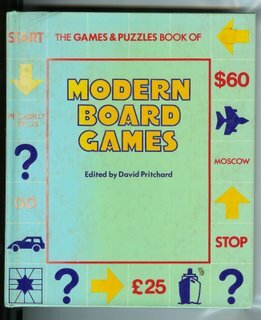 The theme and goals are fairly familiar - be the player "who, after a predetermined number of rounds, has the highest capital" - and the article's author suggests additional equipment for playing the game - a pocket calculator. Speculate was modelled on the South African Stock Exchange in Johannesburg. Quotage: "It is [the] element of surprise, while sometimes infuriating, that captures the spirit of real-life market trends." Chapter 11, the third article from our Super Abstract Reviewer David Wells, discusses the abstract conflict game Ploy. This game barely scrapes a 6.04 on the Geek, although I think the article is probably Wells's most approachable. Quotage: "The pieces are actually coloured coral and green - attractive without being too pastel and 'pretty'. For convenience we shall call them Black and White..."
Chapter 12 sees the return of our "authority on proprietary games" John Humphries with an article on Confrontation. Humphries reviews overall strategy as well as specific responses to certain situations. Quotage: "Although [Confrontation] is a serious game, it can provide a great deal of fun, particularly when overkill occurs, or if a player is unable to launch his planned attacks because of a pre-emptive strike." Chapter 13, the book's final article, and John Humphries' shortest, features Escape from Colditz - a game that we own and I have still never played AFAICR, although of course Fraser has many times. A brief overview of gameplay is followed by a discussion of tactics and strategy - with a strong emphasis on the fun factor that the game can offer. Quotage: "Escape from Colditz should be played for fun and in fact can be very amusing as well as frustrating and tense at times." So that's just one of the books we found today. Others include a book about my parents' honeymoon (sort of - well, they get a mention), another on game theory and statistical decision making, and a program of a 1970 australian tour by the American Bridge Team complete with signatures of many of the luminaries who attended. (My mother was quick to point out that this tour nearly caused the breakdown of the marriage that had been celebrated with the honeymoon). My reading shelves are filling up - and meanwhile, I want to play all 13 of the games in the book so as to validate the articles for myself. If only time were more easily stretched. I'm wondering if this is the same book I picked up at a bargain bookshop when I was a child and Mother refused to buy it for me. She's scarred me for life, you know; not giving in to my gamer's whims... Perhaps that's why I buy so many games these days? Do you have the ISBN number? Nice find! Geek is right on the Scrabble designer, though. James Brunot was the first publisher, if I remember my Word Freak correctly. David Parlett is the author of a number of books about games and also the first (1979) SdJ winner "Hare & Tortoise"
Very nice summary of an interesting book. With those books in the family, it's no wonder you are really into gaming. Nice summary, Melissa. I've heard of the book, but never read it--maybe I should look it up. Butts designed Scrabble (another very interesting story) and tried to market it himself. He eventually gave up and sold the rights to Brunot, who made some cosmetic changes (he essentially did for Scrabble what Charles Darrow did for Monopoly), had some success in the sales, and eventually sold the rights to Selchow & Richter, which is when the game really hit it big. I guess by '75, Botts' story hadn't yet been disclosed. Diplomacy was first published in 1958, but I know Calhamer had been working on the game for quite a long while, so it wouldn't surprise me if the game was a finished product by 1954. I also think the second quote is pretty accurate in the game's innovations. In fact, I consider Dip one of the most, if not the most, innovative game ever created. Thanks for going into such detail. Thanks, all, for the comments. I'd say the book is well worth getting through a library or borrowing from somewhere; not so sure that I would be going out and buying a copy, though, unless I was very keen on one of the games in there.